Couple years ago I started training for 5K races after a 10 year complete break from running, I am 44 now. I was just running more for fitness & fun, and noticed my mile time... 5.38 predicted a much faster 5K time than I could produce. According to race conversion calculators I should have been able to run low 19's. But my times were around 20:15. I realize this formula (like other performance calculators) assumes training for 5K to same degree as I did for the mile. But that is the confusing thing, because I DID train more for 5K than the mile! I was running 3times a week, 20 miles a week, mostly tempo type runs. I decided I must have lost my 'base' over the 10 year break, and so was unable to hold the speed I have over distance. So for last 2 years, I have rebuild my base somewhat, running 40 miles week for a year, then last month Jan/Feb 2012 as going into 5K race reason for me, I've dropped the mileage to around 25-30 a week, and I've gradually added lactic threshold runs, and some Vo2max ( mile intervals) ..and I have done NO speed work i.e no fast intervals etc. I don't know what my mile time is now, but my 5K is down to mid 19's ...still slower than that predicted time from 2 year ago!, and I'll bet my mile time is in fact even faster now with no training for it! This is true right down the speed curve, I can run 13 second for 100m, 28 for 200m, and 1.05 for 400m .....what is stranger still, I was college team runner at 10K, pb. 33 minutes ..and best mile 4.40 ....and never a sprinter ..I was 130lbs 5'10 back then....I am 150lbs now ....mostly added upper body muscle ...so i'm wondering if the 10 years I took off running and built muscle has increased my speed at cost of lost ability to hold 'speed endurance' ...I know type II a fast twitch fibre's can 'swap'...so maybe I retrained them for speed? I feel the lactic threshold runs seem to be bringing the biggest improvement, to bring the speed I have up into 5K ...but is there anything else I can do? My aim this season is to break 19 minutes, which I think I have good chance, but really feel I should be able to run 6 minute miles (18:30'ish) based on most prediction formula's. 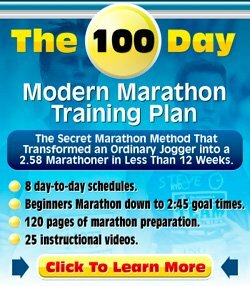 Thanks for your question about achieving your 5k goal of sub-19. Thanks for providing all the extra information. First of all, a race conversion calculator is most useful when comparing recent races. I am not sure when you did this 5.38 mile, but if it is 10 years ago, it's of no use. You need a recent race to compare to. Even then, as you have experienced, it is not a guarantee. You need to have the right amounts and right types of training in order to make it to your goal. The thing I like about your program is the variety. You are doing some fast and some slower running. a) For three months or so work some more on re-building a base. Do easy runs, long runs and tempo runs. Start with one weekly tempo run and in the last month of your base building period, do two tempo runs. Note, I am just giving some general guidelines, feel free to deviate. b) Make sure you build up your long run to a long distance, i.e. 10 miles or so. I have noticed in times that when I stopped my running and started again, that when I started hitting 90 minutes once a week I'd really start seeing good improvements. c) I like the 5 mile continuous tempo run, but also do tempo intervals. They'll allow you to work on getting that lactic acid threshold pace down. E.g. you could do 6 x 1 mile one week, then next week 4 x 1.5 mile, then 3 x 2 miles, then 2 x 3 miles etc. d) After the three months of base building start including intervals in the mix. For simplicity, say you do one interval session, one tempo run and one long run per week. Keep that long run long and keep on doing the tempo sessions as described before. e) With intervals, I have got the feeling your mile-intervals are a bit too long. As a rough guideline, make sure an interval lasts for a max of five minutes. And mix it up a bit. Do 400s, 800s, 1k, 1200m etc. I hope all together that gives you a good idea about what to do. I think once your lactic acid runs are down from 6:50/mile to 6:30/mile and your intervals are at about 3:40-3:50/k then you should be ready to get to a sub-19 5k. Tempo Running - Some more info re tempo running. Interval Running - About intervals. Dominique thanks for the detailed training idea's, its appreciated. The mile time 5.38 was 2years ago, after I had been running again for about 1 year following 10 year break, doing mostly tempo's but some 400m intervals. So 2 year ago I consistently ran 1.05 for 400m, 28sec for 200m, 5.40'ish for mile, and 20:15 to 20:30 for 5K ...the 5K seemed slow..and yeah, lack of base and poor LT threshold seems to be the reason as you summerized. I think your program looks great, I had dropped the long run ( had built up to 10 miles as you say) to try to improve my LT runs. At 44 nearly 45 I find my body doesn't handle high mileage (over 40 miles week) so I have to be careful. The good news I am now noticing some BIG improvements, and in last few weeks my LT runs are down from 6.50 to 6.40 ...and I think your dead on right that I need them around 6.30 .. I feel i'm getting close to 19minutes ...but I think your right that to keep improving, I need to mix that long run back in, and also add some faster intervals again. Here in Phoenix I try to race mostly March/April before its too hot! ..so I have few races coming up and see if I can break it this season, if not, i'll just rebuild over 6months as you say, and aim for next season, no rush, I know it takes time!